DURING THE BOOM YEARS OF THE 1980-90s. there was a vast expansion in the size of art museums the world over. It ranged from the London National Gallery Sainsbury wing built in 1991, the National Gallery of Ireland that expanded on the back of the country’s building boom, not to mention President François Mitterrand's Louvre makeover during 1981–2002 including the 1989 redesign of the entrance of the Cour Napoléon by the architect I.M. Pei. The museum visitor has to tackle a greatly increased amount of real-estate given over to art in the name of culture. Not to mention equally important works of art on paper, art museums contain vast acreages of air-conditioned space hung with painted canvas, timber, slate and copper, covered in oil, egg tempera, encaustic and, in modern art museums, acrylic-resin-based paints. For a visit to a large and important art museum you seriously need to be mentally prepared. You will do a lot of walking and this entails wearing comfortable walking shoes so that half way through you do not begin to wonder whether it is worth all the stress. The advantage of large museums is that at some point in your perambulation you will come across a refugio where you can relieve the weight on your sore feet and information overload with a meal and a drink. To seriously gain the full value an art museum offers, look on the enterprise as the cultural equivalent of preparing for the thousand year old pilgrimage on foot to Santiago De Compostela. There is a current perception that museums are, in fact, a branch of the leisure industry, rather than the visible face of our cultural heritage. The introduction of a business manager taking over the post once occupied by the museum director has reinforced the tendency to monetize a nation’s intellectual legacy. The museum curator, who was usually a prominent art scholar, is now often promoted sideways. Google News has reinforced this perception by burying art, artists, museums and galleries in the Entertainment section. The art-visitor to big-budget Old Master exhibitions, is viewed in this philosophy as consumer. Ones unpleasant sensation is that of being fed through a cultural sausage-machine, accepting, resignedly, bullying guards that tell visitors to, ‘keep moving, keep moving’ or in the case of the author visiting the Rijksmuseum’s 2006 celebration of Rembrandt’s birth, being shouted at by an attendant for lingering in front of Rembrandts ‘Night Watch’ and thus inconveniently holding up the projection of a silly laser-based Son et Lumière entertainment that used, improbably, Rembrandt’s masterpiece as the screen on to which it was projected. A much better idea is to visit smaller museums when travelling. 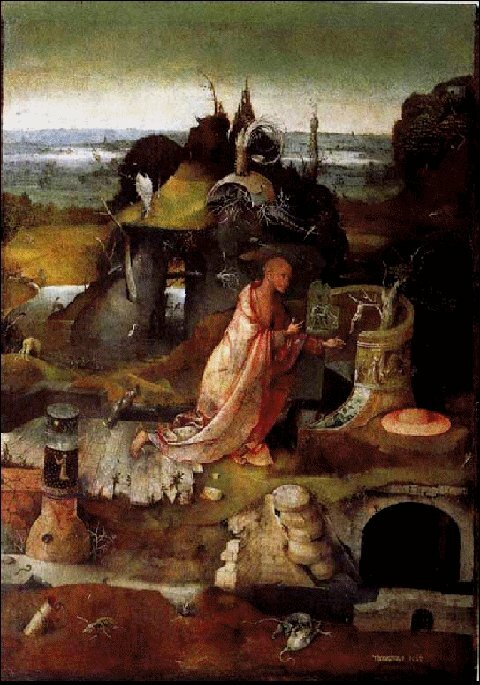 One of the unexpected pleasures of doing this is to come across rare and unexpected masterpieces like the series of Hieronymus Bosch panel paintings that are hidden away in the lower depths of Palazzo Ducale in Venice. Another city, Milan, has the advantage of possessing a number of small and very important art museums (Pinacotece), the Brera, the equally important Poldi Pezzoli and the Museo Ambrosiano all three crammed with masterpieces. These art museums are small enough to allow one to enjoy their beauties without stress. The Museo Ambrosiano was the Palace of Cardinal Federico Borromeo who was archbishop of Milan. It contains the notable painting, ‘Basket of Fruit’ created by Caravaggio about 1599. Jan Brueghel de Velours the son of the Flemish master Peter Brueghel had a long-lasting friendship with Borromeo and well after the artist returned from his Italian tour to work in Antwerp the cardinal continued to commission paintings from him, in particular landscapes, still-lifes and flower until the artist's untimely death in 1625. The Cardinal acquired at least 35 paintings from Brueghel making it the biggest collection of Flemish paintings outside the Low Countries. Many of these remain at the Pinacoteca Ambrosiano including Jan Brueghel de Velour’s 1610 painting on a copper panel 'Daniel in the lion's den’. Caravaggio’s, ‘Basket of Fruit’ in the Museo Ambrosiano is matched by another, the ‘Supper at Emmaus’ in the Brera museum. It is a different version of the same subject in the London, National Gallery. The National Gallery earlier (1601) work is much more blatantly Baroque, with dramatic hand gestures on the part of Christ and the two disciples, Luke and Cleophas, theatrical lighting and cast shadows thrown on the wall behind the seated figures in a 1920s German Expressionist film manner. The later (1606) much more sober Brera version in Room 29 is executed with a limited range of colours. It is surrounded by painting by artists that might not be familiar at first hand such as Mattia Preti, (Mother offering her children to the Redeemer) or Orazio Gentileschi, (the Martyrs). 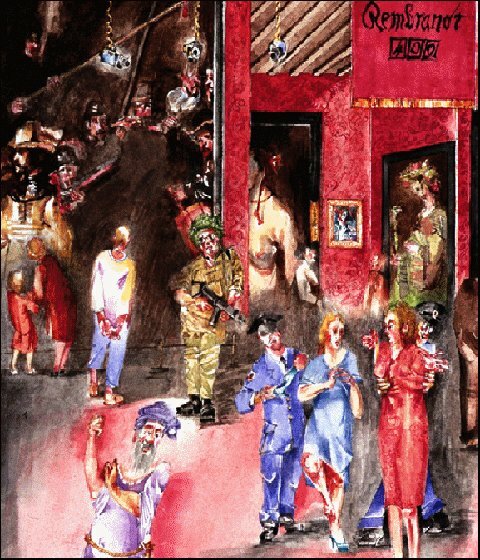 Their works show the deep influence this rebel artist, seemingly taken from the pages of Colin Wilson's 1956 homage to existentialism, The Outsider, immediately had on his fellow artists. 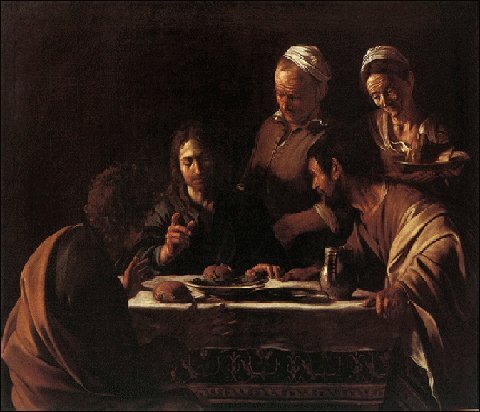 His dramatic chiaroscuro style spread quickly to the Low Countries particularly the Dutch Baroque artists labelled the Caravaggisti like Gerrit van Honthorst, Matthias Stomer and Hendrick Terbrugghen, who may have seen and been influenced by this later version. Caravaggio’s revolutionary style eventually permeated through to the works of Rembrandt himself. The opportunity to browse through a reasonably sized museum gives the cultivated visitor, not only the art student, an opportunity to increase their expertise in a surprisingly deep degree. An interesting feature of the Brera is the manner in which Maria Teresa of Austria in 1776 created the museum alongside an Academy of Fine Arts, emulating the 1563 Accademia delle Arti del Disegno founded by Giorgio Vasari and Cosimo I de' Medici in Florence, an idea followed at a later date by the Dublin National College of Art. The concept was a school of art inside a museum where young artists could see at close hand the achievements of the Old Masters and, emulating compositions, ideas and painterly techniques of previous generations not find it necessary to reinvent the wheel. The idea of the Accademia is still active and popular in Florence and the Brera. However, even before the student revolution of ’68 the academy had fallen into disuse. Academic art had acquired a negative connotation in France, Ireland and elsewhere, being seen as fossilized, repetitive, unimaginative and commercialized. When finally you do escape into daylight and the real world, rather than having, as it were, done this museum or visited that National Gallery you will, through the eyes of the ancient masters you just left behind, notice how closely, in the words of Oscar Wilde, nature seems to imitate art.